Come meet the pioneers who are applying engineered biology to revolutionize agriculture, medicine, energy, and the production of food, consumer products, chemicals and materials. 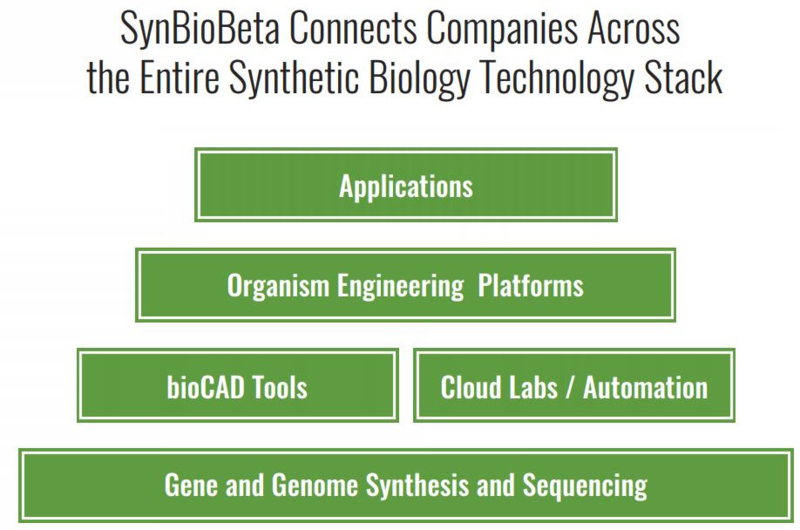 At SynBioBeta, you will join a growing community of entrepreneurs, academics, investors, and thought-leaders committed to advancing biological engineering. We’ll showcase cutting-edge synthetic biology research and technologies that are transforming how we fuel, heal and feed the world, and give you the opportunity to meet with the bright minds building and shaping the bioeconomy. Industry and Startups: Get critical opportunities to network, exhibit, and make the connections that you and your company need to grow. Investors and Angels: Keep a finger on the pulse of technological development, and meet founders and investors. Technology Scouts: Learn who the leading lights are in each segment, identify value-adding technologies, and lay the groundwork for further deals. Academics: Gain access to professionals ranging from eager potential cofounders to sagely experienced entrepreneurs and well-connected investors. Students and Biohackers: Get yourself involved by meeting industry leaders and laying the groundwork for your community connections. Pioneers and Thought-leaders: Meet the people leading the field or coming to the conference from other industry leadership positions. Policy makers: Meet those creating vibrant innovation ecosystems in their global and local regions. Tech Practitioners: Hear about the latest technology, spot the upcoming trends, and meet the key people busily building the future.